Following an outstanding college career, the left-handed Stabler was chosen by the Raiders in the second round of the 1968 NFL/AFL draft. He was farmed out for a brief apprenticeship in the Continental Football League in ’68 and spent 1969 on injured reserve before he saw his first regular season NFL action as the third-string QB in 1970. Knee injuries robbed Stabler of his mobility, but “The Snake” was an accurate passer who took over as starting QB in 1973 and led the league in completion percentage (62.7) while earning selection to the Pro Bowl. He followed that up with a MVP and consensus All-Pro season in 1974 in which he led the NFL with 26 TD passes and a TD percentage of 8.4 as the Raiders advanced to the AFC Championship game for the second straight year. They made it three straight in ’75, although Stabler had a lesser year as he struggled with another knee injury and tossed 24 interceptions. Raiders went 13-1 to finish first in the AFC West with the conference’s best record while leading the NFL in touchdown passes (33). Won AFC Divisional playoff over New England Patriots (24-21), AFC Championship over Pittsburgh Steelers (24-7), and Super Bowl over Minnesota Vikings (32-14). Stabler was again a Pro Bowl selection in 1977 and threw for a career-high 3615 yards in 1979. Traded to the Houston Oilers for QB Dan Pastorini with the expectation that he would get the Oilers into the Super Bowl, he instead endured two disappointing seasons before moving on to New Orleans for the last three years of his career. 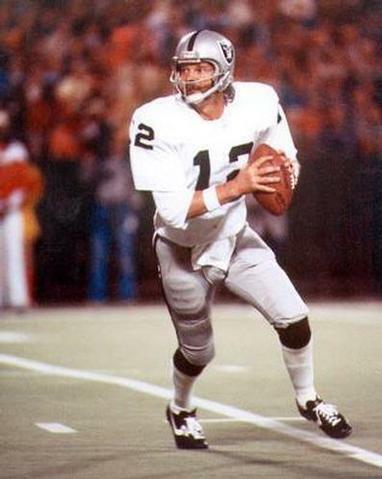 Overall, Stabler threw for 27,938 yards and, prone to taking chances, gave up 222 interceptions as opposed to 194 TDs. However, he was named to the Pro Bowl four times, his regular season record was 96-49-1, and he was 7-5 in postseason play.